QRQC (Quick Response Quality Control) is one of the most powerful tools of Quality Management. It makes it easier to solve most of the manufacturing and functional problems in a simple and logical way. Volume 1 presented QRQC initial steps (Detection, Communication, Analysis and Verification), as well as the first step of the approach ("RESOLUTION"). 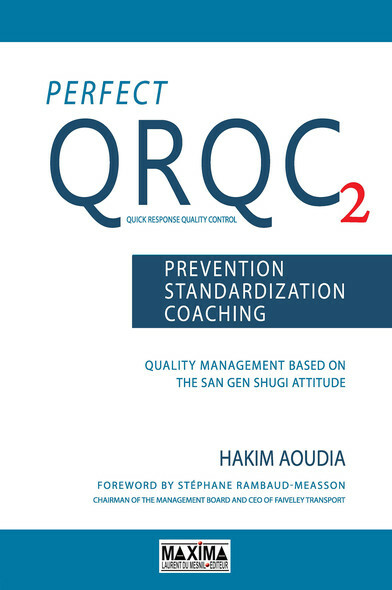 In Volume 2, three steps are explained in detail: "Prevention", "Standardization" and "Coaching". The step "PREVENTION" aims to permanently eradicate problems, including on other production lines or in other locations or at other customers'. The step "STANDARDISATION" involves building on experience from past mistakes through technical reviews, standardizing new robust design standards by using formalisation or updates, then implementing 100% of these design standards to 100% of the projects. Finally the third step "COACHING" is probably one of the most important steps in the approach. It presents a practical method of understanding and a training on the "Perfect QRQC" approach as a whole. With this second book, the author remains true to the principle that contributed to the success of his previous book: to provide simple and educational guidance that is easy to understand by managers and technicians, and to enable a practical implementation with positive and measurable results in terms of customer and staff satisfaction. Remember that the management of problems is fundamental to the building of expertise and know-how in a company. Increase product reliability and product design which are the root cause of mutual trust between a supplier and its client.